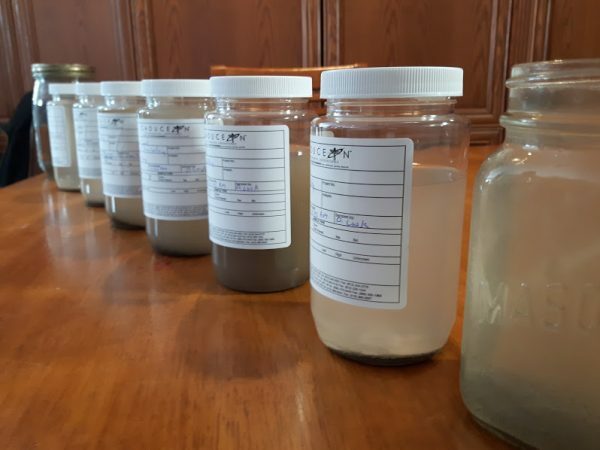 Samples of contaminated well water from homes in North Kent. Local water activists are up in arms over plans for Chatham-Kent’s Chief Medical Officer of Health to speak about groundwater at an upcoming conference. Dr David Colby is one of the presenters at the Wind Turbine Noise Conference in Portugal this June, slated to talk about wind turbines and groundwater contamination. However, Water Wells First officials say without a proper Health Hazard Investigation into the issue locally, Dr Colby’s presentation may be somewhat premature. Municipal officials say that Colby is attending the conference at his own expense and requests for a copy of his address would not be released for public review. It’s not the first time Dr Colby has raised the ire of the local group. At a public meeting put on by Pattern Development in 2017, the Medical Officer said he didn’t believe visible sediment found in local wells was a danger to human health, a statement members of Water Wells First took exception to.